For all sorts of cross- and angle-cutting tasks, a miter saw is a woodworker's friend. But, to really maximize its potential, you need a good home base for your saw - and that's what this project delivers. The stand is a full 8 ft. long, in order to provide generous support tables on either side of the saw. They'll help you cut down long stock with ease. The support table fences are equipped with Kreg's aluminum track system and flip stop, for setting up precise cutoff lengths or carrying out repetitive cutting jobs. You'll also notice that the saw is mounted on a center platform that slides back and forth and locks in place. It enables you to mount a backup board directly to the saw's metal fences for tearout free cutting, then align the saw flush with the project's fixed fences. When you need to tilt the machine for bevel cuts, just pull the platform forward of the fences and tip the saw as usual. No versatility lost here. Warning to Bosch Miter Saw Owners! Loving this build so far. I actually started on the table before my new Bosch CM10GD 10” miter saw arrived and I didn’t even check to see if it would fit (my bad!). I now have the table built (minus some finishing, doors, scrap bins, and top rails) and have realized the saw (barely!) doesn’t fit. 1. Edit the plans to give you about 1/2” more width in the middle section. 2. Cut out the lip on both sides of the miter saw base. Each lip is about 1/4” and comes off pretty easily with a jigsaw. Regardless of what you do, you’ll also have to cut out a chunk from the back. I’m not worried about this as I’ll just cut out a rectangular chunk and then add some of the trim to make it look like it was part of the build. I haven't built it yet. But it is the ideal plans for my shop. The plans are well laid out and well presented. 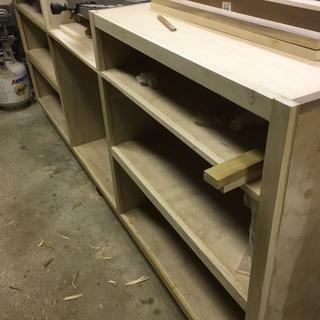 The miter stand itself is fleshed out with added details that are not really necessary but nice to have _ storage boxes for cut offs for example. It's a good piece, and the plan is more than sufficient to get it built. Great plans, well laid out easy to follow. The project would have been great as drawn and designed, but what's the fun in that. I made a couple of small changes. Doors over all the shelf openings and pull out drawers on guides instead of bins. Also, I extended the back panel up about an inch to create a lip in the back so things wouldn't roll off. Going in I knew Iwas not going to be able to use the exact dimensions of the plan due to shop and equipment constraints. Iwas looking at plan after plan trying to incorporate elements of each into my final and succeeded in just confusing myself into "writers block". The fundamentals of this plan got me started and kept me from getting dangerously creative along the way other than a few alternate methods to cover my lack of assets such as a biscuit joiner. As a word of warning, the writer is not kidding when he says this plan is simple but BIG. It was more work than I anticipated and I didn't do it all. Nevertheless, I now have a solid addition to my shop that should outlast me. As a word of advice, because this is a substantial investment of time, don't chince on the material. 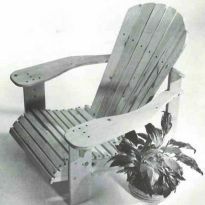 Maple is a great idea for looks, durability and pride of ownership. It looks and works great in spite of the mistakes I made along the way. I do not regret getting this plan. Product recommended. Completed project needs to be modified from original Rockler plan for individual space and utilization objectives. I have been needing a miter saw stand for some time now. and this patter is just the ticket . can't wait to get started on it! I had a blast building this unit. Plans are crystal clear. My only suggestion would be to use drawer glides on the mitre saw platform. These plans call for the platform to slide back and forth on the wood panel beneath it. With the weight of the mitre saw it's much too heavy to move easily without glides. I use my saw much more frequently now. The Kreg t bar and stop are very useful for repetitive cuts. I had a hard time trying to buy the plan because I am not in the US. but now I have the plan, I can figure out an idea as I don't had a place to put it in when complete, but I may yet built it in 2-3 parts with wheels. The plans are very good and well detailed- I modified mine to make a skinnier unit to fit into a smaller area. 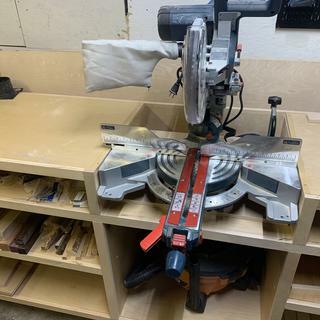 I added a Ridgid 10" sliding miter saw and a vacuum activated through the power switch- the switch and vac work fine but I need to modify the saw for better vacuum pick up of the sawdust. Also I added a layer of formica to the top of the wings to make it last longer. Good plans, good design- just buy them already! I made this stand for my new miter saw and I love it. Only had to make a few adjustments so that my saw fit. Works like a charm. I did not need a portable miter saw table so this table works well in the space I have dedicated in my shop. It is unlikely I will move the table except when I move the shop to a new location. I love this project. the only change I would make if I built it again was to make it a little shorter for my shop. In my workshop it would fit a little better if it was shorter. My fault, not the fault of the plans. When you build it, take into account better than I did how it will fit in your shop and tailor the plan to your space. 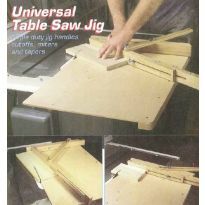 I found this miter saw plan very helpful with easy instructions to follow. The stand looks and works great. Awsome addition to my growing small shop! 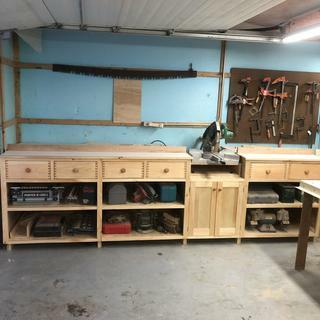 My buddy and I have turned our love of woodworking into a growing cabinet business. As we work to make our small shop as productive as possible we thought this table might be a good idea. As it turned out it was a TERRIFIC idea! Fairly easy to build, this design has really improved our efficiency and ability to accurately cut long pieces. Love the switch that turns the vacuum on with the saw and allows it to run for a few seconds after in order to clear most of the sawdust. For around $300, I cannot imagine a better investment for a small shop. Thanks!!! 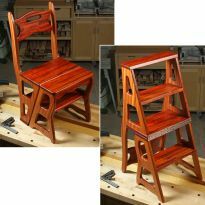 I have seen several different versions of Miter Saw stands and this is one of the better ones. I have a small garage for a woodworking shop and everything is mobile. This fits in very nicely for me, not difficult to build. I like the fence for measuring where the stops go and all of the compartments for storage so where you go all of the equipment for the saw goes with you. Good job. Highly recommend this stand. 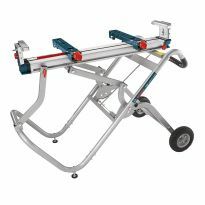 I looked at many miter saw stand plans. 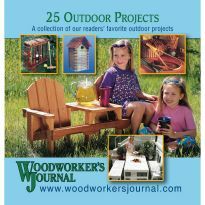 I selected the Woodworker's Journal plan as the best. It is a great project. I figured it out, but could see how more of a beginner would need more details on some basics to get through it okay. The plan is good. I modified it for what I needed. It’s 11’ over all. 7’ to the left of the blade and 4’ to the right. The plan calls for maple veneer plywood. I used B/C plywood and melamine for the top. I spent around $350 to build this. Maple and castors would be significantly more. 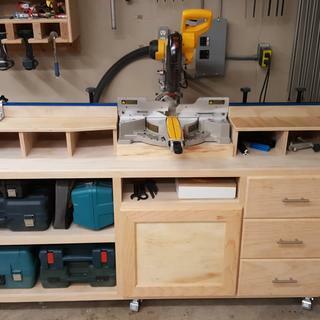 Overall, this bench is a great addition to my shop and needed storage. Glad I chose this plan, needs some editing and fixing of some measurements that were provided, but was very useful and well designed. Like it was said in other reviews, these are not instructions, they are plans. I purchased knowing this and am not surprised thanks to the others who came before me. But I am disappointed still in the lack of proper plans being provided. Lots of mistakes and misleading dimensions. A few more Dado cuts were needed to build as the author intended and a few other things missing or changed if you do not read the entire instructions. Seems the author got lazy and did not want to go back and fix his cut list dimensions. So read it all first. Then make notes of the additions to the measurments. I spent about 3 weeks studying these and pricing this out. Then another week measuring and cutting and then a day or 2 assembling. It was not difficult as I am a pro at assembling prefab furniture, but although I am still learning on making my own furniture, it was pretty simple. The more tools you have, the easier this will be. 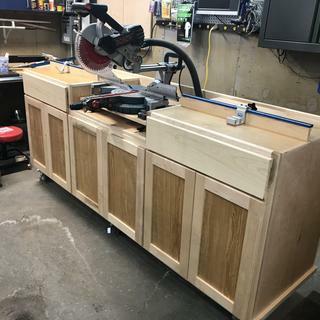 I was able to make this my own in making it fit my little shop and have plans now that it is together to make some more modifications now that I am actually using it. 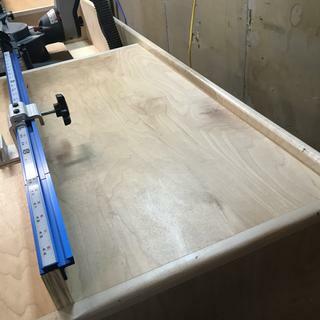 I have a 12" sliding miter that needs more space than what the plans show, so I will be modifying more to accommodate the angle cuts and dust collection. I was able to make it for much less than others have noted. I used a nice plywood and added some t-tracks for my Rockler cookies and other things that I use often in my production for my wife's designs she does for her business. Overall, I am glad I chose this plan over many others I looked at. 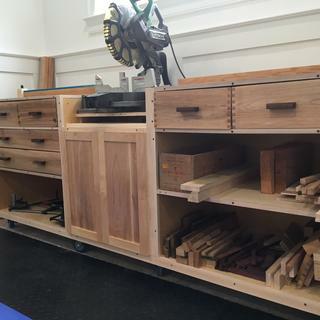 Provides some good storage space for my many power tools and such - which is wonderful for me in my smaller shop. The plans were easy to read and follow. I rarely ever build something exactly according to plans. 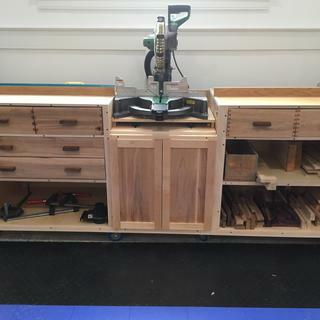 This work station helped me solve a number of storage issues and allowed me to practice my dovetail and box joints. Two larger drawers fill some further storage needs. I used a lot of parts I had saved from other projects like door hinges and drawer slides. Also had some t-track so I designed a shop made stop to slide along the left side. Sorry but it saved me $65. Even with shop vac attached it still throws off a ton of dust. Doubt I will ever use the dust port feature. Made some draw pulls out of some leftover walnut which I like. Generally very functional and good looking piece. Still have to plug screw holes and complete tongue oil finish Everything I own is on wheels so this fits nicely. It's not obvious but I built this in two pieces and attached side to side. Otherwise way too big if you need to move it someday. The plan is a pretty good starting point. 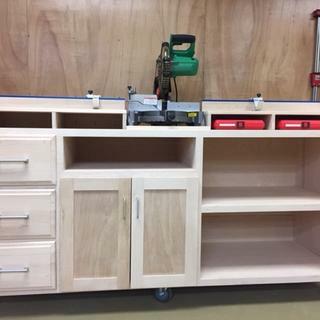 I modified the plan by adding drawers and cabinet doors. I also shifted the saw cutout to the right to provide more space on the left table. I used the Rockler track and 3 inch flip stop on the left side fence. With the exception of the back panel which is 1/2 inch birch faced ply the structure is built from 3/4 birch faced plywood. The table surface is covered with 1/8 inch hardboard. I also had to make an angled cutout on the left of the saw to accommodate the full miter range of the Dewalt 12" sliding miter saw. The fence is set back 15 inches to allow for the full 90 degree cutting range of the saw. The plans are easily understandable, easy to budget with. We plan on building one for the new shop. These are good plans, but they are not to be confused with instructions. In the plans you get Materials list, Cuts, dimensions, mention of hardware used. I do not recommend these plans for beginners though. 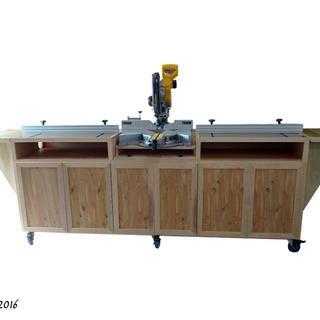 This is the nicest looking miter saw bench I have seen so I decided to purchase the plans. I knew when i purchased the plans though that I was going to change some things. I just didnt realize how much I would change. After looking through the plans the first time I decided to change quite a bit. In fact I basically only used the plans for the carcass. The plans call for Maple Plywood and maple hardwood. I decided to use pine plywood and pine board to significantly reduce cost. I also opted not to use the cubby drawers on the top and instead built drawers to one side of the table. I also decided I wanted my fence to move instead of building a movable platform for the miter saw itself. I moved the table back away from the edge to leave room up front for me to sit pieces of wood that I cut. I opted for one door instead of 2 as I already had a set of hinges in my shop and did not want to by more. So that saved me some bucks there. I hardly ever cut to the right of the blade so I decided to shorten the table on one side, which shortened the bench about 18 inches. 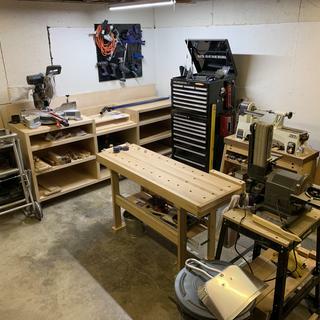 Which is great because my shop is a 2 car garage and every bit of extra floor space counts. All in all I think these are good plans. Just change the type of wood you buy and it saves you a lot of money. The reason I gave these plans a 4 star rating instead of 5 because the way its built in the plans are just overkill. There are to many different joinery methods including biscuit joints, pocket holes, nails, dados. Also gave it 4 stars because if you follow the plans to the letter. You will end up spending way to much to build this bench. It can be built much more economically. I built this and while I really like the design I made a few modifications. These plans are nice but missing a few details like the depth of the Dados and some assembly information but no big deal. It is a nice stand. A few things I did different. 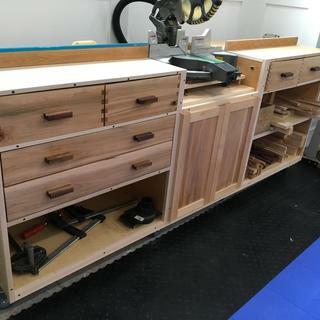 I did pull out drawers with bearings and at the time of the picture I still plan on adding more. Also The adjustable knobs for the saw I put underneath inside the cabinet and I made 4 sides for the box the saw sits on so it wouldn't fill up with saw dust. Might be a good table...some parts are alittle tough to understand. First major project in my new garage, worked great, the plans were easy to follow. Lumber very expensive. I made some modification to fit my needs. I've started work on this excellent design; looking good so far. The instructions are clear but these days a video build guide is almost the norm. A video guide for this project (for members) would be a terrific enhancement. I have not had time to build this as of yet. I like the way the plans are laid out and look forward to building one with a few modifications. This are great set of plans the cut list was spot on. But the building guide was hard to follow at time. I didn't find the plans to be necessary. I ended up wanting modifications, with that I haven't revered much to the plans other than using the overall photos. You can follow the directions, but these are not made for somebody to follow that does not already have a good handle on woodworking techniques / procedures. This obviously is biased as I like step by step, methodical and detailed instructions of which these directions are not. It seems like a really nice project but do not expect these directions to tell you how to build this thing, you must inject your knowledge and experience of woodworking in addition to the directions in order to create this. 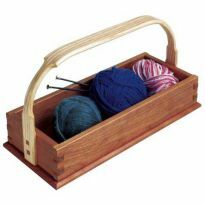 If you are not experienced at woodworking, i.e. looking for detailed instructions explaining every step, these plans are not for you. As a beginning DIY'er I found the instruction video informative but there seemed to be an assumption of a higher level of experience than I enjoy. Plans are Ok, but lots of details not present in plans and require research/thought to fully build cabinet. I agree with all other positive reviews and attributes of this design. 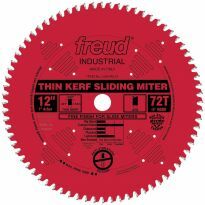 However, there is no mention of the "ideal" size and models of saws that work with this. I have a Mikita LS1016L Double Bevel Slide Miter Saw With Laser 10" with a big and very solid (larger than most) base. Due to the lower slide cylinders that hit the back of the saw box and the saw is too deep and does not fit in the prescribed area. I had to cut out the back of the bench after it was assembled which was a real pain. Secondarily, the depth of the sliding box the saw is to be mounted to was not deep enough to fit my saw. Perhaps I should have been more alert to the footprint and mounting frame of my saw, si I accept that. Yet I doubt that any saw which has a lower set of slide cykindars will fit in this as prescribed. We're all used to modifying stock plans, yet the author should have brought out this issue in the opening dialogue. I would have been better of drawing this out and figuring it all out on my own. The instructions are awful. I am disappointed. This project was challenging for a bigginer. Its not step by step instructions. I left the back stops off so I can use the entire top as a table. I am going to make sliding drawers and put the door on. The cut list could have been more helpfull. Thought I was buying a printed version that would be sent to me in the mail, not downloadable version. I have no printer to be able to print this on paper. I am new at purchasing things on your site and did not realize what I had purchased until it was to late. Needless to say I won't be purchasing anything on line again on your site,it was a waste of my money. The instructions were not very clear and seemed a little cryptic to figure out. I've studied them a lot and I think I'm ready to do the build. Fingers crossed! This plan appears to be functional and affordable to build. Looking forward to the project. Got a new saw, looks perfect for what I need. Trying to organize shop and not have to take down and put up each time I needed to use it. Great plan and need this in my shop! 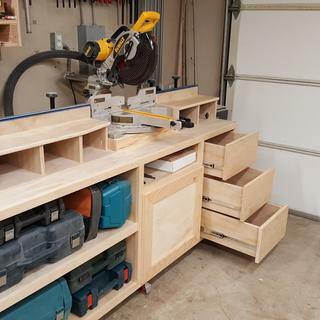 I have looked at several plans for a good Miter Saw stand and this looks good for my limited space and give me much needed storage space. I liked the adjustable saw section. 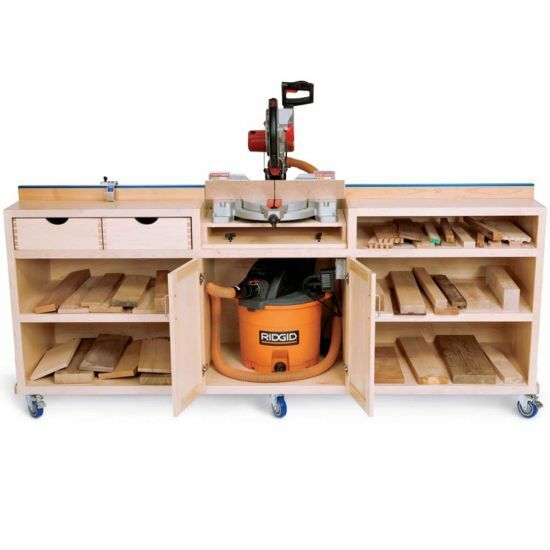 I desperately need a miter saw table and this plan fits the bill! My new shop could use this. It's is exactly what I've been wanting to build for a very long time. Exactly what I've been wanting for a miter saw stand. More functional than the store purchased stands. Best design I've seen and so many options to customize it to fit my shop and saw! Because it looks like exactly what I need. This looks like something that should work nicely with my saw. I have limited amount of space so a mobile stand will be nice. Because its perfect for my shop. Seems like a great way to consolidate space in our tiny shop! I'd like a starting point for building the saw stand. It looks well thought out. I red the reviews, the one star reviews did not discourage me. 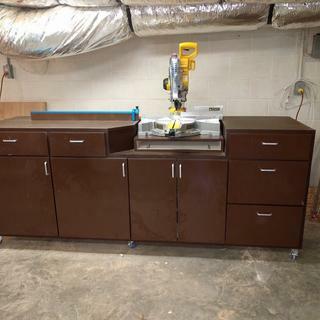 Best looking miter saw station I've seen in a plan. How detailed are the plans? How many pages? Does it include a cut list and source links for the hardware? hinge back will fit on the back side of the face frame. I wish he would have devoted more time on installing the Kreg Trak and Cut and finishing the bench. My shop floor is concrete and a little slick so I put a castor with a lock in the middle along with the ones on the edges. Wonderfully detailed answer Scott. Thanks for the response. I especially appreciates the warnings on the faceplate trim. 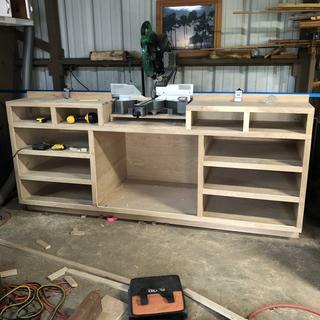 The plans contain a lot of information, there is a cut list, hand a hardware list but i didn't see a source list although most items are available from Rockler I will post some images when i get time as i am very please with how my bench turned out. I did a few modifications like extra doors and increased the length by an extra 4+ feet. How much is the material for this? depth of project? 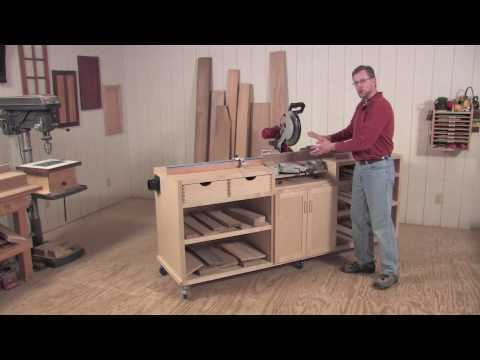 will a sliding compound miter saw fit? BEST ANSWER: 24" depth. Yes this can be use for all type of miter saws. This would not work for my DeWalt 12” compound sliding unit. I would welcome ideas for that unit but it is nearly 36” deep with discharge. What are the overall dimensions of the table? Height from floor to top of saw table?? From the floor to the top of the middle table that the saw sits on is 34". You will need to add the height of your own saw to that as the sizes of saws varied. BTW, I'm impressed with the quality of these plans but would have liked more pictures from different angles. 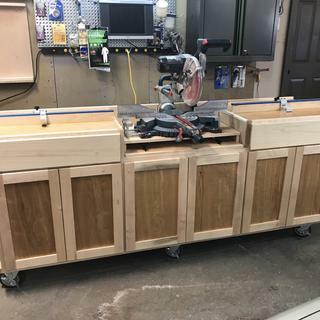 Total height floor to table top = 40 1/2"
I'm using 3/4 maple plywood (and 3/4" pine for the hidden parts) and maple for the face frame and skirts - total materials will run about $500 not counting the rollers. Have fun! Can anyone provide the info on the sliding/locking hinges that the top platform move on? I am curious how they work before committing to this design. BEST ANSWER: Michael, very simple design that works well. Slots cut into the table allow a couple of bolts with washers to pass through. Small knobs (Rockler sells these for very little) secure the platform in place or can be loosened to move platform and saw forward for cutting meters. I think he meant to say he can build this with out buying the plans, he just needs to know how to make the saw slide forward and back. what size shop vac fits in the cabinet? Or, better yet, what are the interior dims of the center cabinet? 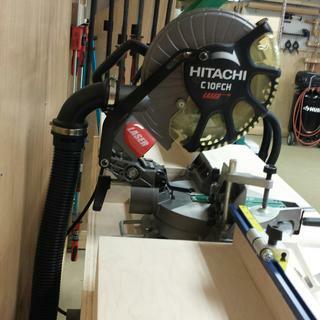 A lot will depend on the size of the port on your miter saw. I have a Dewalt 715 with a 1 1/4 inch port in the back of the saw. Try hooking up a 1 1/4 inch port to a 2 1/2 inch hose. I saw on another blog that a Home Depot Bucket Head hose fiit perfectly and was small. It does a fairly good job of collecting the dust and was inexpensive. 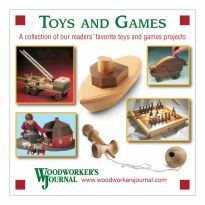 If this is anything like "woodworker's journal" plans for the lumber rack I'm going to be mad I waisted another $7.95. Anyone else have the same experience with their downloadable plans? BEST ANSWER: I found the plans to be complete and error-free. 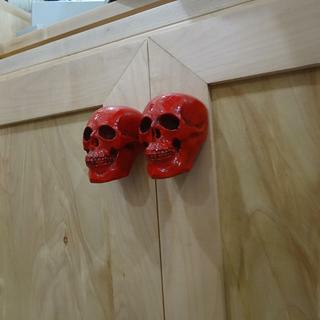 I modified them a bit - didn't make the drawers for example - but for what I needed the plans were fine. My plans were spot on as well. I have no issue with these and would purchase again without a second thought. 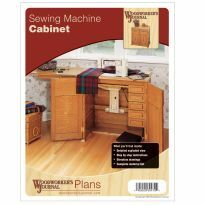 Top of this page shows this category is "Woodworkers Journal Plans"... for what it's worth. How many sheets of plywood does it need? Do the plans contain DXFs or just a pdf with dimensions? 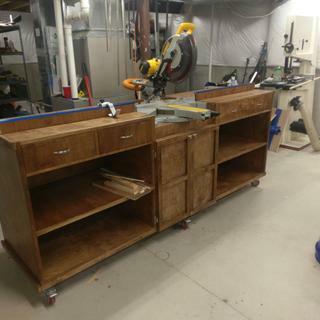 Will this plan accommodate a radial arm saw? BEST ANSWER: As is, it may be a bit narrow (depth-wise) for that purpose. With that said i’m Sure with some modification you could adapt it as it is designed specifically to incorporate the table that’s part of a miter saw. For a RAS, you would want completely flat top without the recessed area for a miter saw. It could with modifications. Standard design will not work. I have a Bosch 12SD which is 26 1/2" wide. Looking at these plans, the top panel is 26 3/4 but it is dadoed into the sides. The moving section is 26". Am I wrong or do i need to bump that middle section out a inch at least and adjust the face frame and all accordingly. Does that make sense? Anyone use these plans with the Bosch saw? Yes It dosnt fit. You will have to make some adjustments prior to building. Dont make the mistake I did and have to modify the table to fit the saw. How can someone on a budget trim the cost of this bench? I like the design but was taken aback by the $300-$350 final cost. Thanks. BEST ANSWER: I dont know what to tell you but all in all I had more than $350 in mine. I figured it cost closer to $600. You can look around and make it for about $100 less. Home Depot had plywood on sale for about $25 a sheet. How do you ensure your saw table (top) is flush with the top sides of this table? Do you measure the height of your saw foot to table face and account for that measurement when building the sled in the middle? BEST ANSWER: You're exactly right, as prescribed by the plans. I build a sled that is slightly under the height of my saw bed. I then attached a bolt and double-nut to the sled. My saw actually rests on the nut that sits just above the sled height. That way, if I need to adjust down the road I simply turn a nut a bit....and any of the four corners can be independently raised or lowered. Will this accommodate a 12” saw? In the magazine there is no cutlist, does the downloadable plans come with one? BEST ANSWER: Yes it will accommodate most saws. 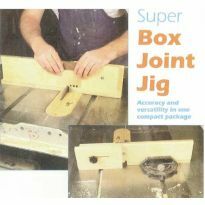 The directions explain how to modify it for your individual saw. Yes it comes with a cut list. Is there video of the assembly around? The only video I see is the overview. BEST ANSWER: I bought the video a couple years ago for the plans to the miter saw movable stand. 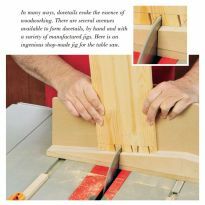 I didn't follow the plan exactly as drawn, put picked up several tips that enhanced my second miter saw I use in my shop. It was well worth the $7.95 and a time saver to get to a finished stand. Marc R.
Is the base of this station a torsion box, or just parallel ribs? I am worried about the bottom platform deflecting on an uneven floor. BEST ANSWER: Just parallel ribs, but with the 3/4 ply base, perimeter ribs and 6 heavy duty casters, there is no real danger of bowing (unless you really load the storage with very heavy items) But if you just use it for scrap wood, (or in my case, tool and jig storage) the design is plenty beefy and holds up well. 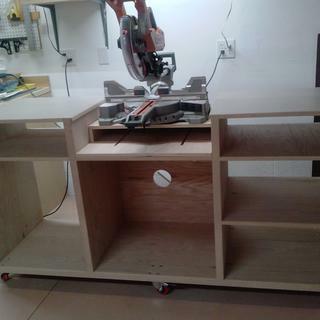 Has anyone made this project for the Festool Kapex miter saw? BEST ANSWER: I haven't (that saw is a little out of my price range!) but the plans are easily customizable for any saw. I had to modify the plans a little for my Craftsman miter saw, but it's easy to do. 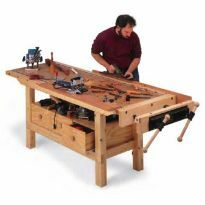 What tools/router bits will I need to build this? Does anyone know the depth of the dadoes for the side and divider panels(from material list #1). The plans show where they go and the width but not the depth? 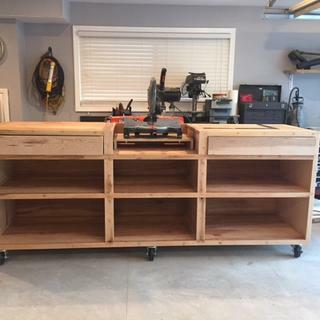 is Chris Marshal able to help me modify the plans to accommodate a router and possibly sanding table that can be interchangeable with the miter saw?